Staffordshire developer Walton Homes has agreed a sponsorship deal with a grass roots junior football team in Rugeley. The developer was approached by Lea Hall FC in relation to sponsoring the team for the 2018-19 season. Amy Summerton, Director at Walton Homes, said: “We’ve always been actively involved with the local communities that we work within, and having sponsored teams throughout the county before, we were happy to support a new team this season. Lea Hall FC currently has 12 teams, from soccer tots to under 15s, including a girls’ team, and we’ll be sponsoring the under 10s. The timing for the team is perfect, as this year sees the boys start to play nine-a-side, and rather than playing at neutral centres and playing in home and away strips to avoid colour clashes. 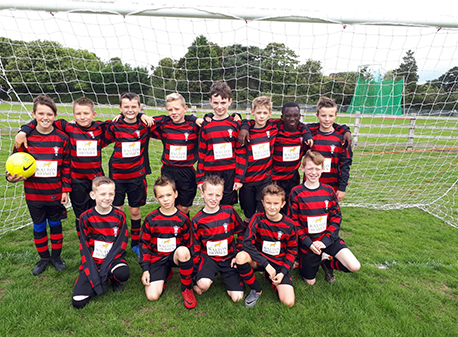 “We were delighted to sponsor the boys’ away kits for the year, and we wish them every success in the Mid Staffs Junior League – we’ll be watching their progress closely!” she added. Iain Murray, manager of Lea Hall FC, said: It means a lot to myself and the boys that there are companies like Walton Homes who are willing to contribute financially towards grassroots football. “The team started their journey in 2014 as U7s playing in the Mid Staffs Junior Football League, and of the original ten squad members that started our first season, seven still play in the U11s, which we hope indicates how the club policy of ‘football for everyone’ has helped establish strong relationships. Walton Homes is currently building in Rugeley, with its exclusive Hathorn Manor development.